Time for a Harv and Ri update! As you can see, both are summer ready in their "masked marauder-gear." 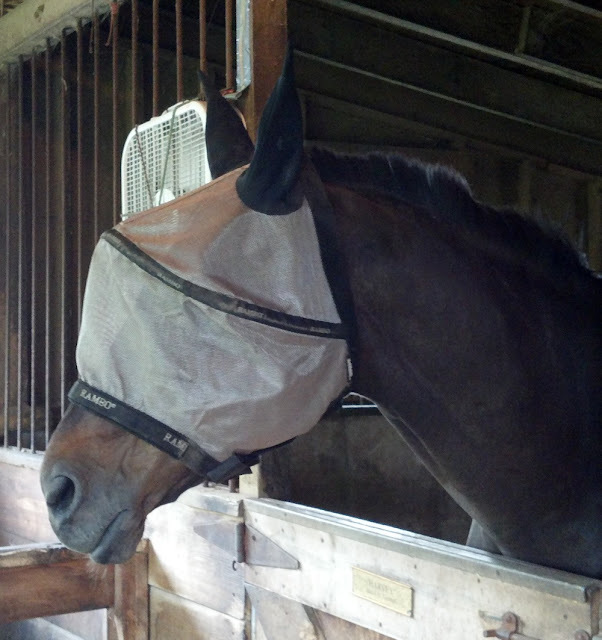 Harv had another fly mask but it rubbed his eye. Harv is an "in-between" size for fly masks, and they are either ready-to-fall-off huge or just a bit too small. 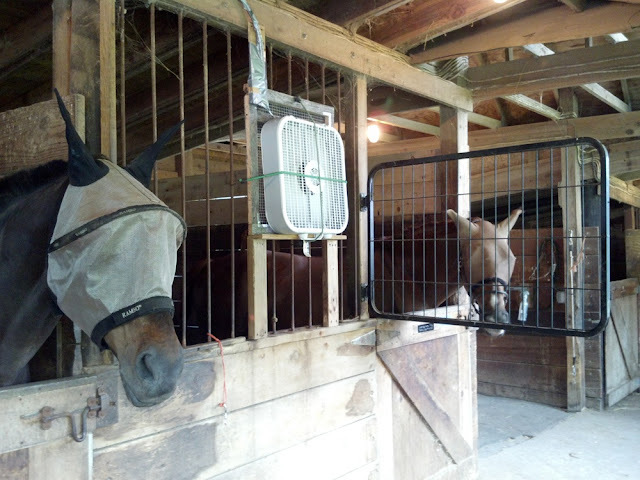 I opted for the latter initially, and ended up with a horse that needed eyedrops. 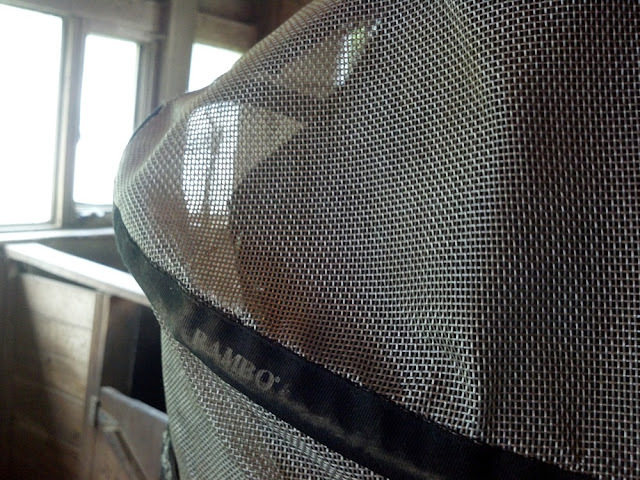 I started looking for a fly mask that would more effectively stay free of his eyes, and I found this great Rambo Plus fly mask. It has a stiffened middle area that makes an orb at the eye level. The question is, will Riley enjoy destroying this on turnout??? See how it holdes the scratching mask away from his nice big eye? I went to buy one (or three!) and realized there is no warmblood size - I need the warmblood size in the Cashel - - do these by any chance run large? Or have you seen them in larger sizes anywhere? Looks like a good solution to the eye rub problem. That looks like a good mask - I like how you can snug it up around the nose, as well as lots of eye clearance. Sometimes masks are so loose around the nose/cheek area that bugs could just fly right in! I thought this was a great idea. I am making a tack store wanted list and I think I will add this Rambo! Billie - our large headed Friesian cross has a horse sized, and it's too big for her - just discovered we can't keep it on her because she slips out with it as tight as it adjusts! So,yes, it runs large. My horse wears fly masks as long as there are no ears but my problem is he has two spots on his face where the bottom band has rubbed off the hair. He has a thin blaze with two vertical black "lines" (like an electric plug turned sideways). I'm putting Vitamin E cream on them and the hair is starting to grow back, but the fly mask situation is depressing. The Farnam masks are being cut smaller (I compared two "Horse" sized masks--an old ond and a new one just out of the box). The Cashel is a nice mask but the band hits "that spot," which isn't helping with hair growth. The Rambo looks like it's sets a bit lower. I might try that. As for scratches on the eyes, watch for loose threads, too. Those are buggers. Oh, thanks, Net - I appreciate the info. I wonder with the longish ears if the smallest size would work for mini donkeys?